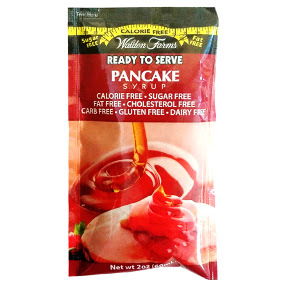 2 fl oz pancake syrup in individual size packet. Calorie Free. Sugar Free. Fat Free. Carb Free. Gluten Free. A convenient travel size for on the go. Ingredients: triple filtered purified water, maple flavor, natural flavors, cellulose gum, salt, sucralose, potassium sorbate (to preserve freshness), lactic acid. Contains trace calories.